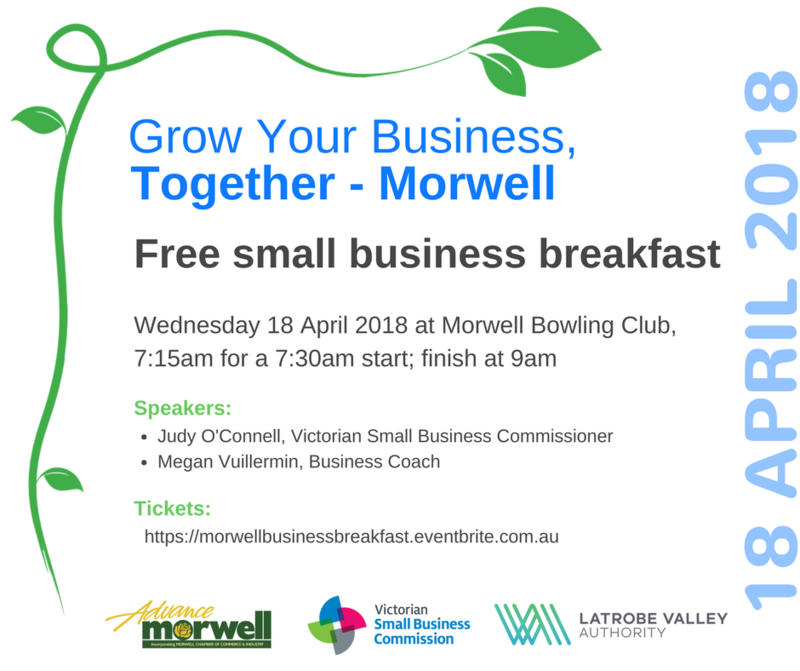 Guest speakers include Victorian Small Business Commissioner Judy O’Connell and Business Coach Megan Vuillermin. - The value of a combined business voice for our town. - How a strong network can boost our individual and shared success. - The benefits of being a member of a group such as Advance Morwell. 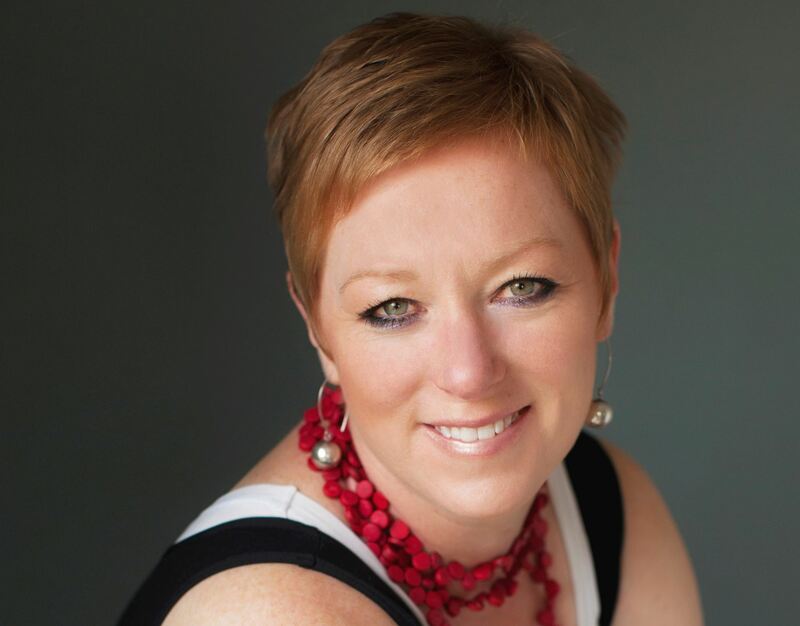 - Five strategies to help boost your business on social media. - How to find and talk to your audience. - Practical tips to help your business thrive. The event includes a free cooked breakfast and the chance to network with other local business owners and operators. Bring along your business card for a chance to win a lucky door prize! 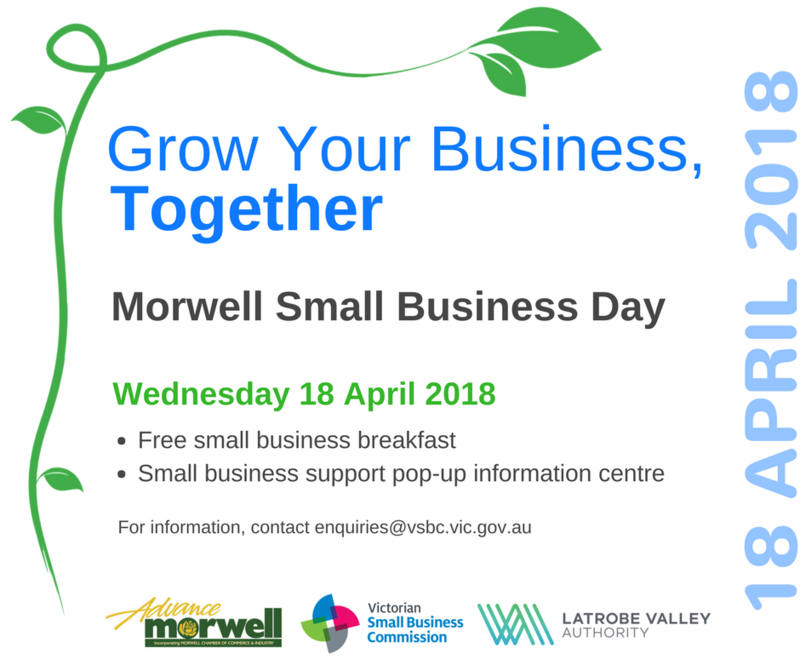 This event is being hosted by Advance Morwell with support from the Latrobe Valley Authority and Victorian Small Business Commission. Get your business questions answered by local, state and federal government agencies in one location at Legacy Place, Morwell on Wednesday 18 April between 10am-1pm. Hear from the Victorian Small Business Commission, Latrobe Valley Authority, Australian Securities and Investments Commission, Consumer Affairs Victoria, Fair Work Ombudsman, Rural Financial Counsellors, Regional Development Victoria, Sustainability Victoria, Australian Taxation Office, and many more. If you have a new business idea, need help employing staff, want to reduce your energy bills, need advice on resolving a business dispute, or have any other business-related questions, this is the place to come. No bookings required and it’s FREE! Legacy Place is located on Commercial Road, opposite Tarwin Street. There will even be a free sausage sizzle for those business owners and operators who attend! Congratulations to Advance Morwell member John Jacovou manager of the Morwell ANZ Bank branch on his 30 years of service with ANZ. John began his career with the bank in Morwell 30 years ago and has served in a number of roles in a variety of locations before coming back to work in the Latrobe Valley with roles in the Traralgon & Morwell branches. 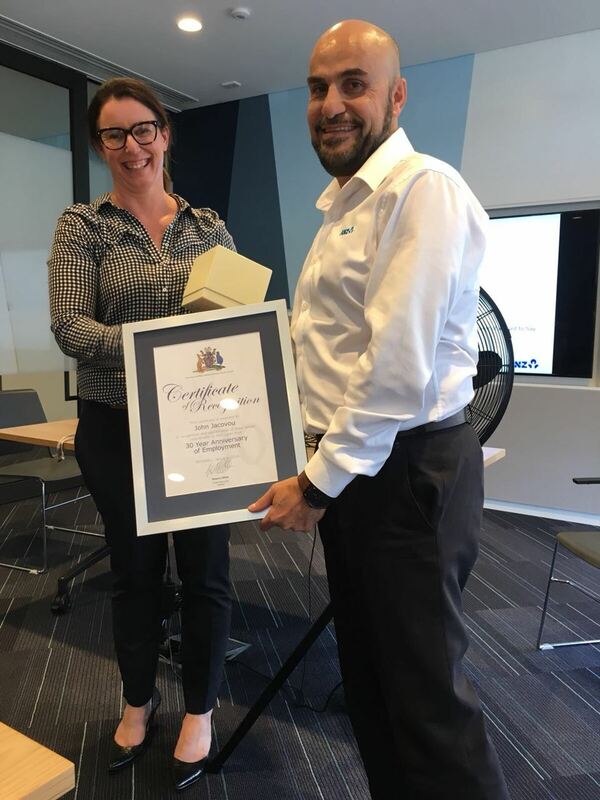 Photo of John receiving his award from Kate Wallis, District Manager Gippsland. 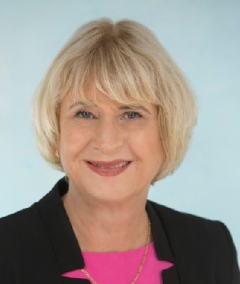 Advance Morwell congratulates Helloworld Travel Morwell owned by proud Advance Morwell member Irene O’Donnell on their awards. Three employees of the Helloworld Morwell travel franchise were recognised at the recent industry awards evening. Joy Martin received her Silver Achievement Award. Helloworld Morwell is the most experienced travel agency in the Latrobe Valley with over 70 years combined travel experience in the team, over 85 countries visited, many multiple times, that provides service to its clients before, during and after their travel. Tonight we celebrate 19 years of operation and service by Advance Morwell to the Morwell Community and it is again my pleasure to present a report of our activities over the past year. The Committee have continued to meet on the first Tuesday of the month at the Morwell Centenary Rose Garden Meeting room in Maryvale Crescent to pursue all issues of interest to Morwell and the wider Latrobe Valley. The Advance Morwell Traders Group has also met monthly, organising and supporting promotions in the Morwell CBD. We have grappled with the challenge of obtaining suitable Committee Members who are willing to assume Executive Roles and are indebted to Shashi Bhatti for taking on the role of Treasurer. 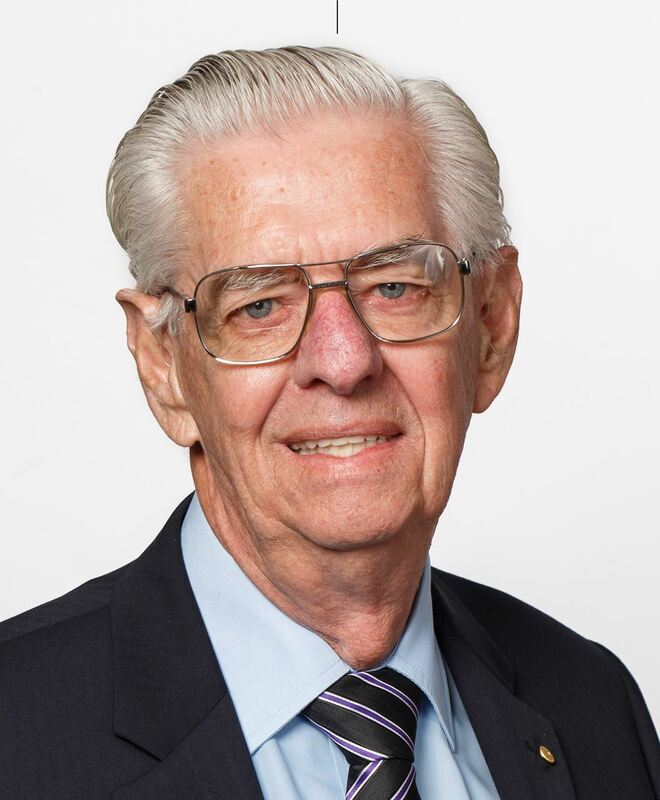 John Guy has continued to represent Advance Morwell on the Morwell Project Group which was formed after the Mine Fire to deliver on a plan for the development of Morwell. RMIT were selected as the consultants and plans were delivered which are now with council for implementation of Stage one which is centered on the area between Hazelwood Road and Tarwin Street. · Continued to work with emergency services about responding, communicating and plans for the future. · Provided support for the door knocks and cleaning for HACC clients etc. · Attended Hazelwood Mine tours to check on progress. · Supported all activities by government agencies where appropriate e.g. EPA consultations. Max Williamson has continued to represent Advance Morwell on the Yallourn Mine Environment Group. Max has also worked closely with the Morwell Centenary Rose Garden Committee to design and erect signage throughout the garden. Signage which has contributed significantly to the garden’s appeal to visitors. The Advance Morwell Committee has actively lobbied on behalf of the Morwell community. We have met with our Morwell Council representatives and had meetings with Harriet Sing Member for Eastern Victoria in the Legislative Assembly. We have been invited to and attended announcements by the Premier at the Latrobe Valley Authority and have had the CEO Karen Cain attend our Committee meeting to update the Committee on the function of the Authority and the projects and initiatives being planned for the future. We welcomed newly appointed Councilor Alan MacFarlane to our Committee meeting for an exchange of views regarding local Council activities. We have continued to work constructively with the Moe and Traralgon Business groups through the Latrobe City Business Tourism Association, a relationship which we intend to further grow and strengthen over the coming year. We have maintained a close relationship with ENGIE through Lauren Carey to ensure we have current knowledge of their plans for rehabilitation and fire protection. After many years, Advance Morwell has relinquished our management of the Arlie Bank Homestead and handed the Building back to Council. The work of Max Williamson in dealing with the many issues that have occurred during our Management of this building is much appreciated, with Max to be commended for the long and at times demanding intrusions on his time. We also recognize the work of Bev Lorraine who has been the occupier of Arlie Bank with her World of Dolls and exhibition which had attracted many visitors to Morwell and its other attractions. Bev went way beyond her role in maintaining the gardens and the overall appearance of Arlie Bank during her term. A General meeting of Members was held on Wednesday 14th June at PowerWorks. Attendance was reasonable and Ian Nethercote provided an insightful presentation on the concept of high efficiency brown coal power plant and had a diversity of opinion on the future use of this within the region at this point of time. Advance Morwell has taken an active interest in Management of Hazelwood Rehabilitation Works and while rehabilitation is underway, greater clarity is still required as to what activities are being undertaken and how this aligns with statutory obligations. Advance Morwell will continue to monitor and be involved in discussions on the Mine rehabilitation as it progresses. Through our membership of Committee for Gippsland we have continually lobbied fro improvement works on the Gippsland rail line. We recognise the importance of these works being escalated for the next stage of rail improvements and have written to Harriett Shing and Mary Aldred at C4G requesting them to work towards the prioritized delivery of the Gippsland Line improvements. The Committee unanimously supported the development of the Traralgon bypass, recognising the economic and connectivity benefits it will deliver to the greater Gippsland area. The retention of the proposed Northern route is supported in order to retain future accessibility the coal resource. As a result of a donation from an unknown benefactor, Musical instruments were purchased and installed at Legacy Place. Some vandalism has occurred and repairs were required to the Drums. David Mc Inness is working on plans to install a power supply. This will provide greater flexibility for future events to be held at Legacy Place. Advance Morwell has been fortunate to have a small group of Morwell Traders as a part of our Committee. The Morwell Traders meet separately and report to the Advance Morwell Committee on a regular basis. The Traders Group are currently busy organizing a special event for Christmas 2017. Advance Morwell again provided $1,000 sponsorship for the Gippsland Antique and Collectables Fair. 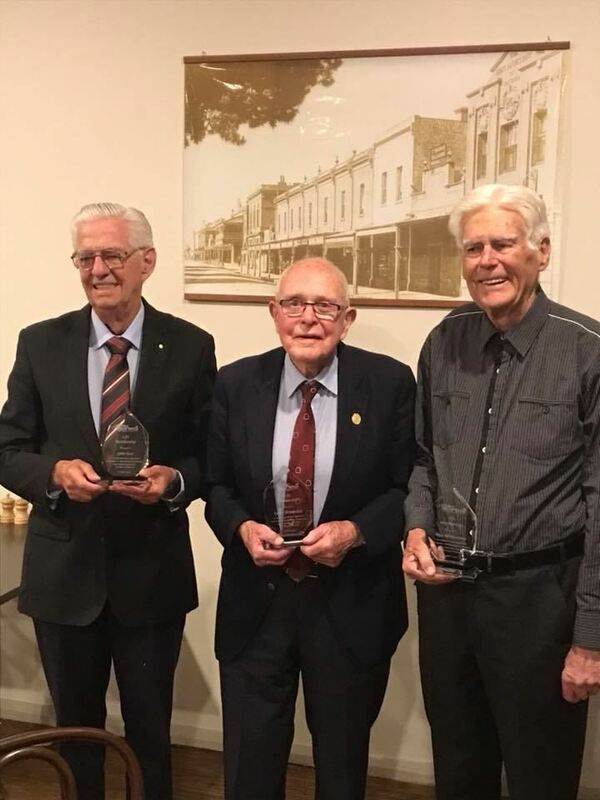 Advance Morwell honoured 3 stalwarts this evening with their Life Memberships to recognise their significant contributions to Morwell over many years. Congratulations & thanks to John Guy, Keith Brownbill & Max Williamson. This event is proudly brought to you by Advance Morwell, we invite you to bring your friends and family to this free community event, filled with live music, carols by candle light thanks to Morwell Rotary Club, special guest "Santa" will be attending with free lollie bags for the kids, face painting, petting zoo, skate park demonstrations, live broad casts, hot food and drinks, switching on the Bank Australia Christmas Lights to help light up the spirit of Christmas in Morwell. Please feel free to invite all your friends through Face Book, and help us to Share this event. This event was made possible by Advance Morwell, Bank Australia, Morwell Rotary Club, Morwell Lions. 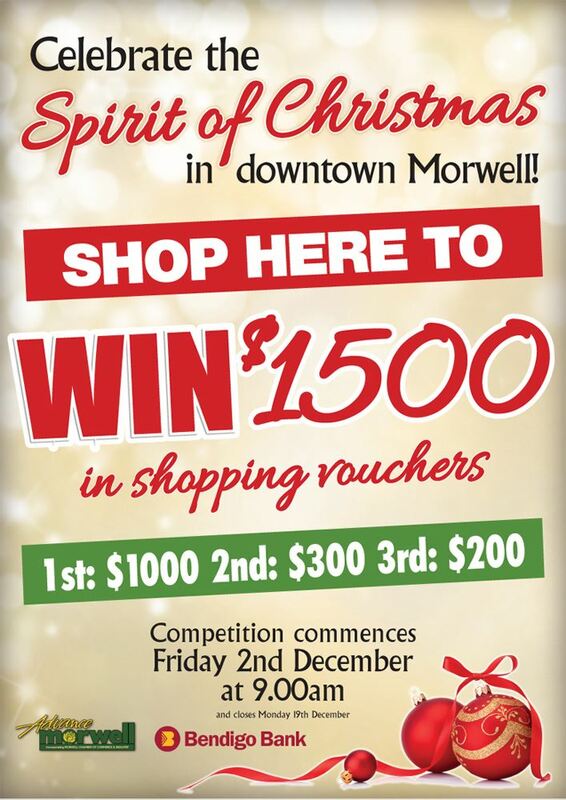 Today is the launch the Spirit of Christmas Shoppers Competition with an ALL DAY SALE TODAY, Friday Dec 2nd. Morwell’s Legacy Place is now home to three outdoor musical instruments following Advance Morwell’s receipt of a $20,000 anonymous donation. According to Advance Morwell spokesman, Max Williamson, the donation from a philanthropic supporter was given on the condition that it was spent on a permanent improvement to Morwell that enhanced the town. 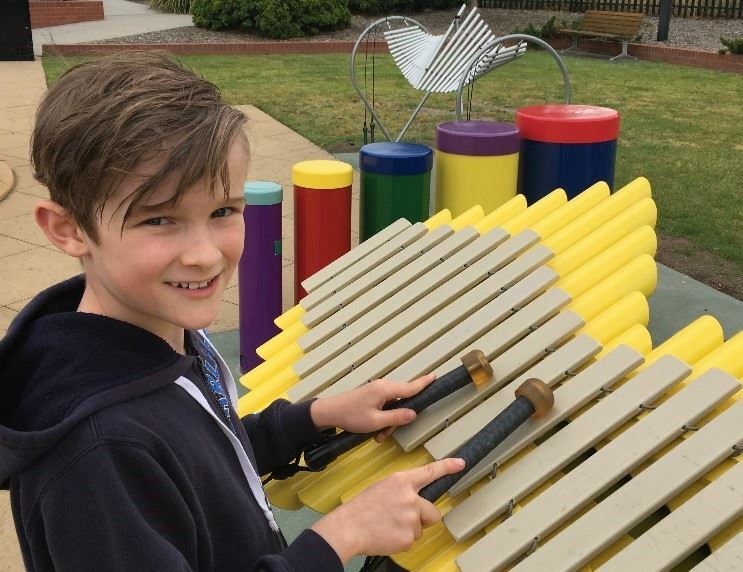 “Advance Morwell has put great deal of thought into what we could purchase with the donation and decided upon musical instruments as they would provide a new attraction for children.” Said Mr Williamson. “It was decided to place the musical instruments in Legacy Place as they would not only be a drawcard for youngsters and their parents, but would also help raise the profile of Morwell’s Sir Stanley Savige, the founder of Legacy.” He added. Pictured : Morwell’s Callum Sennett enjoying the new musical instruments. Hazelwood Closure - A New Begining? Advance Morwell has welcomed the announcement that the Premier will lead a Latrobe Valley Taskforce in response to the Hazelwood Power Station closure. According to Advance Morwell spokesperson John Guy, the premier’s involvement in the Taskforce is a step in the right direction. The Latrobe Valley Taskforce is a great initiative and while the Premier’s involvement is good to see, the reality is that the transition away from brown coal generation is such a big issue that it will require input from all levels of government.” said Mr. Guy. “We are calling on the Premier to invite representatives from the local community, Latrobe City, the Federal Government and Committee for Gippsland to participate to participate in a forum that will inform the Cabinet in a forum that will inform the Cabinet Taskforce.” he added. Advance Morwell is taking a broader view of the anticipated closure of Hazelwood, seeing this is the first in a series of significant generation plant closures which will impact the region over many years to come. “Regions all over the world have experienced the scale of change the Latrobe Valley is about to endure and regardless of the industries involved, the impacts on their communities and economies have been significant – some well-managed, but unfortunately most not.” said Mr. Guy. Advance Morwell believes there is a requirement for a long term, comprehensive and multi-faceted strategy, that will not only deal with the impact of Hazelwood’s closure, but also plan for the future closure of other generation assets in the region. “While we are hearing about the immediate job losses in the power industry and our hearts go out to those individuals who will be losing their jobs as a result, there will be much broader impacts felt throughout the region as the economic repercussions of the closure flow on to our small business operators, their employees and families.” said Mr. Guy. “The alternative, will be social and economic devastation that that the rest of the Victorian community will have to bear for many years to come” he added.